Seniors First BC (formerly BC Centre for Elder Advocacy and Support - BCCEAS) is a non-profit organization helping older adults. They operate Seniors' Legal Clinics in the Lower Mainland and a toll-free Seniors Advocacy and Information Line (SAIL) that provides information and referrals. 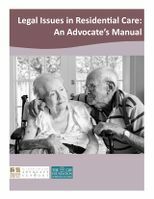 Website: The Resources section has fact sheets and e-books on residential care and elder abuse. This page was last edited on 12 May 2017, at 11:26.